-- I am Flint 13, and I am the blade itself; wrought red upon the blooded sands. 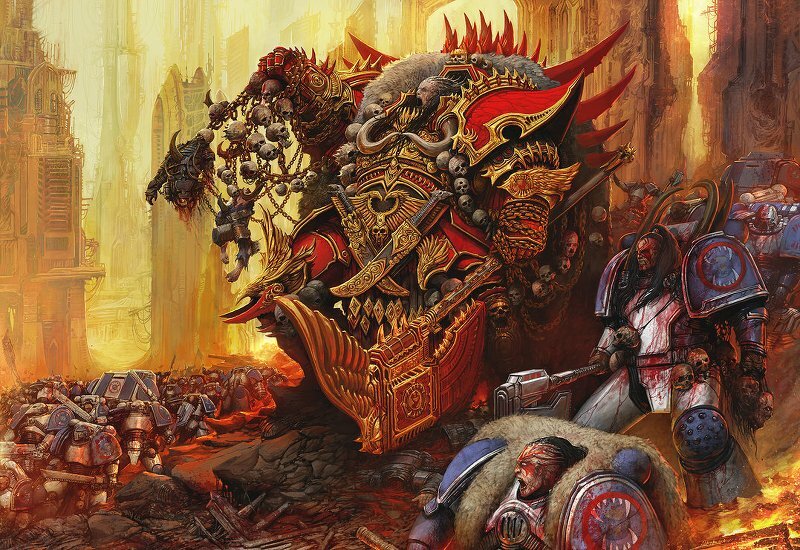 As a proud daughter of Angron, I command the 28th Company of the Twelfth legion, the Children of Cuth Vasi. "Woe be to the enemies of the Cuth Va'san, for their cities shall crumble and their skies shall bleed with the ashes of their fallen." -- I am Jaspcat, and I stand as a Son of Angron. I command the 14th Company of the Twelfth legion, The Slaves of Anor, the breachers of walls and the lineage of Dalkeith the armoured bane. --I am KrautScientist, and I command the World Eaters' 4th assault company, "Khorne's Eternal Hunt". Though our legion might be an empty shell of its former glory, we still endure. As was taught to us by Angron, our lord and father, we hunt. We fight. We kill. And we still have our honour. "In the endless cold between the stars, there is only the hunter and his prey. All that remains is the hunt, for only the hunt is eternal." -- I am Relict and I stand a proud Son of Angron. I command the LXXVII Battle Company, III Echelon, XII Legion - the Iron Devourers. "The Emperor created us as tools to be blunted and then discarded. The Warmaster has delivered us from that fate. From this day forward, we march as a part of his grand design - one company, one will, many minds. The dogs of the Emperor shall curse our name and dread our coming, for we are the Iron Devourers and none shall find us wanting. To war, my brothers!" The Scions of Gorechild follow in the footseteps of Khârn The Betrayer- blood must be shed, and it matters not whose blood flows, just so long as it flows. "Led" by the brutal Lord Korlath, the Scions of Gorechild are currently engaged in the war of Trovana Prime. Korlath was prosmied blood by other Chaos warbands on Trovana, thus his warband has joined in the slaughter. She is clearly Omegon if this is her second Legion roll call organizer. The Scions of Gorechild stand wrought in red. Welcome to our humble (bloody) corner of the Galaxy, Pandemicus! Edited by Flint13, 01 August 2014 - 07:25 PM. Just like how Omegon runs the al spie network. The similarities are too much battlesis. I am demon2027, and I command the World Eaters 21st Company, through my proxy Maximinus Thrax, the Spartan Lord, last son of the techno gladiator, scion of the red sand. Skulls for the Legion, Blood for the Primarch. Hope that's ok. I haven't worked on my World Eaters in a while but I am tempted now. I, Paladin 7221, stand as a Pre-Heresy son of Angron. Through my mouthpiece of Captain Kharlos Rieekan of the 25th Grand Company, I spit nothing but hatred, scorn and defiance at the chained lackeys of the Terran Corpse. Edited by Paladin7221, 01 August 2014 - 09:27 PM. Welcome to the fold, brother-slaughterers! I wish I saved a picture of my World Eater on Space Marine. Welcome to the fold Brother Paladin and Brother Demon. Come rejoice in the tails of bloodshed and glory making! The pit felt empty without you. Fellow brothers and sisters of the arena your all bastards and slaves that have been cast from your families and homes. But the sands of the arena are the closest thing you will now find to comfort, there are no rules here only glory and honour to be upheld. We were once the greatest the strongest the best. Though our legion is bought destruction upon itself we still have a god king that fights while his brothers hide behind breasts of bickering gods. So tear free from stasis and know there's blood to be shed and honour to be taken from the foes of our race and scream your bloody oaths to the sky so even the gods may tremble at our power and wrath. Welcome to the arena and make your last breaths count. I'm no frothing-mad berzerker, but I might have dabbled in the fields of Khorne a time or two. Some time ago, a friend wanted me to do a custom Khan for him, but not long after I started on it, he quit the hobby and I never finished it. But the then I was struck by the siren song of Forge World's Horus Heresy and never looked back. Or finished this guy. Brother the rage flows through you, in honour of this I dub you brother chaplain rage! What have I done wrong with my badge? I am Khârn the Bloody, and I stand in this arena like a true son of Angron. I command the 16th Company of our Legion through the glorious times of the Heresy, and my proxy is called Tiberius Thanatos, Commander of the Battleship "Merciless". Post Heresy, his place is taken by Drakon, also known as "The Tyrant of Numida", commander of Angron's Chosens. As you see, I like to tie my fluff to minor names in Gw's one. The Battleship "Merciless" was shown in a picture of Visions of Heresy (I think), while the warband known as "Angron's Chosens" was listed among those that fought on Armageddon in an old WD. You need to save for web and the background must be transparent. ...and the one I supplied did have a transparent background and was a PNG. Yours is now a JPG, for some reason: maybe you saved it that way, maybe it has something to do with uploading on Flickr. But in order for the background to show as transparent, you'll need to keep it in the original PNG format I provided. Hope this helps! @ Khârn the Bloody: Welcome to the slaughter, mate! I think it must have done that when I saved it to my ipad. Will pull my laptop out later and sort it out. Edited by Demon2027, 02 August 2014 - 12:08 PM. My name is Poom and I am a proud World Eaters legionnaire; I follow Captain Khârn, the bloody, the un-slain and his 8th Assault Company into the black sands of the Urgall Depression to hunt down the very last of the Ravens Sons. Not very imaginative but I just love Khârn and his buddys like Jeddek, Kargos, Esca and Skane.. I hope to one day honor them all with a miniature. @ Demon2027: That's the spirit! Thanks for the badge! Awesome!